Product prices and availability are accurate as of 2019-03-24 07:25:36 EDT and are subject to change. Any price and availability information displayed on http://www.amazon.com/ at the time of purchase will apply to the purchase of this product. Technology and safety in the bath or kitchen now go hand in hand! 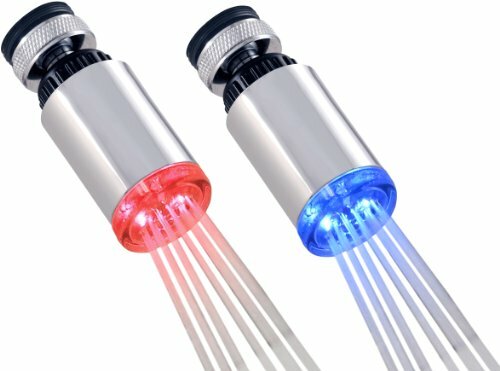 This LED faucet Aerator in chrome finish, lights up to indicate temperature, red for hot, blue for cold, and includes swivel adapter to fit most faucets. Swivel adapter is Female 55/64” threaded nut. Additional black plastic adapter piece is 55/64”-27 to 15/16”-27 threads and allows for nearly universal use on most faucets. 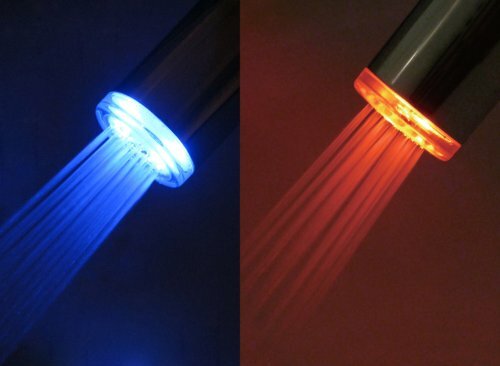 This LED aerator is temperature sensitive and changes color from red (above 35°C/95°F) to blue (below 35°C/95°F). 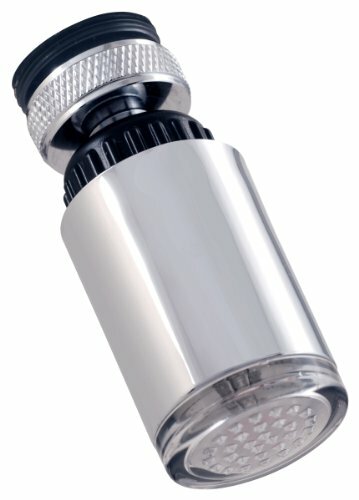 The powerful spray has a 2.2 GPM flow rate and makes this aerator ideal for use in either kitchens or bathrooms. The sleek design and chrome finish complement a wide variety of faucets by using the black plastic adapter. It powers itself from your faucets water pressure so there are no batteries to replace. The LED Aerator meets AB1953 requirements as lead-free and is completely safe for drinking water. Add to all of your home Baths or Kitchen today!.